February 4 is the 35th day of the year in the Gregorian calendar.There are 330 days remaining until the end of the year(331 in leap years). Year 211 (CCXI) was a common year starting on Tuesday of the Julian calendar. At the time, it was known as the Year of the Consulship of Terentius and Bassus. The denomination 211 for this year has been used since the early medieval period, when the Anno Domini calendar era became the prevalent method in Europe for naming years. Septimius Severus, also known as Severus, was Roman emperor from 193 to 211. He was born in Leptis Magna in the Roman province of Africa. As a young man he advanced through the cursus honorum—the customary succession of offices—under the reigns of Marcus Aurelius and Commodus. Severus seized power after the death of Emperor Pertinax in 193 during the Year of the Five Emperors. The Caledonians or the Caledonian Confederacy were a Brittonic-speaking (Celtic) tribal confederacy in what is now Scotland during the Iron Age and Roman eras. The Greek form of the tribal name gave rise to the name Caledonia for their territory. 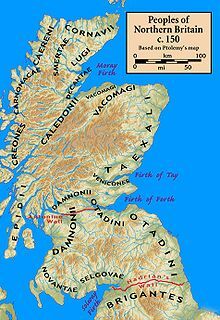 The Caledonians were considered to be a group of Britons, but later, after the Roman conquest of the southern half of Britain, the northern inhabitants were distinguished as Picts, thought to be a related people who would have also spoken a Brittonic language. The Caledonian Britons were thus enemies of the Roman Empire, which was the occupying force then administering most of Great Britain as the Roman province of Britannia. Year 1447 (MCDXLVII) was a common year starting on Sunday of the Julian calendar. Ludovico Lazzarelli was an Italian poet, philosopher, courtier, hermeticist and (likely) magician and diviner of the early Renaissance. Year 1495 (MCDXCV) was a common year starting on Thursday of the Julian calendar). Year 708 (DCCVIII) was a leap year starting on Sunday of the Julian calendar. The denomination 708 for this year has been used since the early medieval period, when the Anno Domini calendar era became the prevalent method in Europe for naming years. Pope Sisinnius was Pope from 15 January to his death in 708. Year 856 (DCCCLVI) was a leap year starting on Wednesday of the Julian calendar. Saint Rimbert was archbishop of Bremen-Hamburg from 865 until his death. Saint Veronica was a woman of Jerusalem in the first century AD, according to Christian Sacred tradition. A celebrated saint in many pious Christian countries, the Acta Sanctorum published by the Bollandists listed her feast under July 12, but the German Jesuit scholar Joseph Braun cited her commemoration in Festi Marianni on 13 January. Saint Andrea Corsini was an Italian Roman Catholic prelate and professed member from the Carmelites who served as the Bishop of Fiesole from 1349 until his death. Corsini led a wild and dissolute life until an encounter with his mother moved him to go to the Santa Maria del Carmine church where he became resolved to join the Carmelites as a priest and friar. He exercised various roles in the order until he accepted with reluctance his episcopal position where he was resolved to impose greater mortifications upon himself and dedicate himself to the plight of the poor. Gilbert of Sempringham, CRSA, the founder of the Gilbertine Order, was the only Englishman to found a conventual order, mainly because the Abbot of Cîteaux declined his request to assist him in organising a group of women who wanted to live as nuns, living with lay brothers and sisters, in 1148. In the end he founded a double monastery of canons regular and nuns. Rabanus Maurus Magnentius , also known as Hrabanus or Rhabanus, was a Frankish Benedictine monk, theologian, poet, encyclopedist and military writer who became archbishop of Mainz in East Francia. He was the author of the encyclopaedia De rerum naturis. He also wrote treatises on education and grammar and commentaries on the Bible. He was one of the most prominent teachers and writers of the Carolingian age, and was called "Praeceptor Germaniae," or "the teacher of Germany." In the most recent edition of the Roman Martyrology, his feast is given as February 4th and he is qualified as a Saint ('sanctus'). March 26 is the 85th day of the year in the Gregorian calendar. There are 280 days remaining until the end of the year. ↑ Anthony R Birley (1 June 2002). Septimius Severus: The African Emperor. Routledge. p. 238. ISBN 978-1-134-70745-4. ↑ Lorge, Peter (31 December 2015). The Reunification of China: Peace through War under the Song Dynasty. Cambridge University Press. pp. 4–5. ISBN 9781316432273 . Retrieved 3 February 2018. ↑ Ugo Falcando (1998). The History of the Tyrants of Sicily by "Hugo Falcandus," 1154-69. Manchester University Press. p. 216. ISBN 978-0-7190-5435-8. ↑ Calvin Ellis Stowe (1868). Origin and History of the Books of the Bible. Denison. p. 72. ↑ Ludovico Lazzarelli (1 January 2005). Lodovico Lazzarelli (1447-1500): The Hermetic Writings and Related Documents. Arizona Center for Medieval and Renaissance Studies. p. 309. ISBN 978-0-86698-324-2. ↑ Walsh, Pat (2009). The curious case of the Mayo librarian. Cork: Mercier Press. p. 78. ISBN 9781856356152. ↑ "The Parliament of Tasmania from 1856". Parliament of Tasmania . Retrieved 14 February 2018. ↑ "Troubled Finnish ski jumping legend Matti Nykänen dead at 55". Yle News. 2019-02-04. Retrieved 2019-02-08. Wikimedia Commons has media related to February 4 .